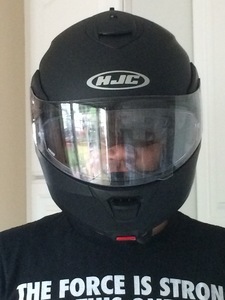 HJC IS-Max II Helmet with Pinlock visor. I waited too long to get this upgrade. Integrated internal sun screen visor is awesome; now I don’t have to carry an additional tinted visor and / or go through the pain of changing. As for the Pinlock, works as advertised. I’ve ridden to work every day (~45 days) since I got it and in both cold (25-30 degrees) and in rain, there has been NO FOGGING in the sight line. I’d recommend spending the additional funds (~$26 in my case) for this add on. I will look for this option / feature when shopping for future helmets. Helmet has deep pockets for audio speakers; I use ear buds, but plenty of space if you have integrated audio headsets. Also good ventilation and air flow. I have a cruiser with a tall windscreen and still get good air flow; I imagine that without a windscreen would be even more air flow. Fit is spot on.